There's new fun challenge on DDCC Blog - Buttons&Bows. 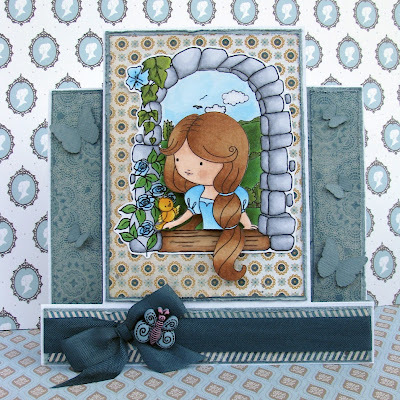 Create cards with buttons and bows and join the fun!! We have a fabulous sponsor this week - Di's Digi Downloads with a great prize of 5 digis to a lucky winner! 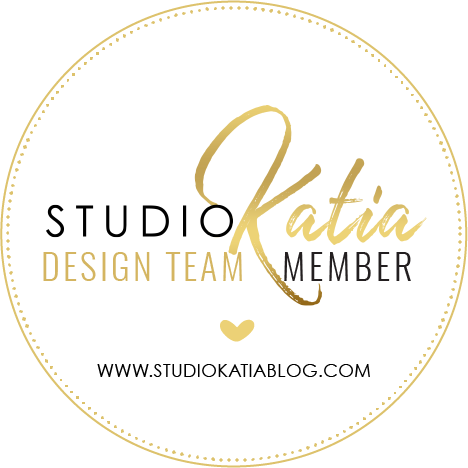 Don't forget to check DDCC blog to see all the fun creations of the DT!! 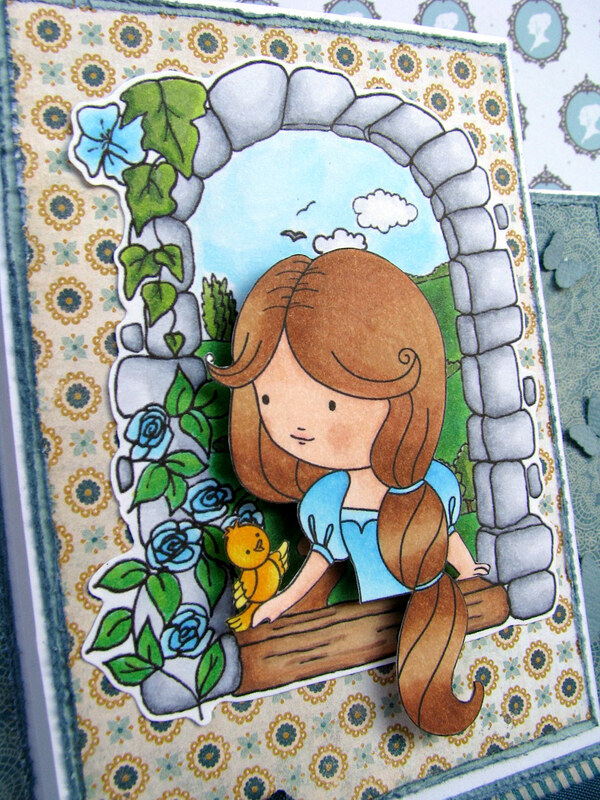 For my card I have used 2 stamps from Di's Shop: Window Princess and Background Castle Window and Meadow. Coloured with copic markers. Also for this one I have tried to make a centre step card. Запрошую вас на блог DDCC узяти участь у новому завданні: банти та ґудзики (Buttons&Bows). Спонсором цього тижня є магазин надзвичайно симпатичних штампів Di's Digi Downloads із чудовим призом - 5 штампів на вибір випадкового переможця. Чекаємо ваших робіт!! Для своєї листівки я використала два штампи із магазину Di's Shop: Window Princess та Background Castle Window and Meadow. Розмалювала фломастерами копік. Окрім того спробувала робити листівку нетипової конструкції (трохи вимірювати треба, але результат того вартує). Ну, і дуже мені дівчинка просилася, аби її зробити об'ємною, тому я її вирізала й наліпила на об'ємні квадратики. Magnificent card. Beautiful colours. Interesting layout. Fantastic 3D ! Good work ! Bravo ! Thanks for joining us at Charisma Cardz Challenge this week. Ух ти, яка краса! Листівка просто надзвичайна! Такий гарний задум, і як завжди просто бездоганно розмальовано! Great folding, love your design and the lovely papers you've used. Thanks so much for joining in with this week's challenge at Charisma Cardz. Gorjuss card, thanks for joining us at Charisma Cardz this week. Auch das ist eine wunderschöne KArte geworden, viel Glück bei den Kreativen Stempelfreunden. Wow, this card looks beautiful! The papers you used are wonderful. Thanx for joining us at the Creative Stamp Friends. 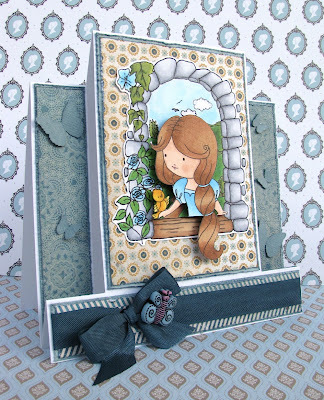 Gorgeous card - love the way you've decoupaged the image! Eine ganz tolle Karte ist das. Gefällt mir sehr gut. this is a really cute card. great colouring! thank you for joining us at fairy tale challenge. Hi, gorgeous card, lovely image & coloring! What a wonderful card. I love it.